FOREST HILLS, MI (CelebrityAccess MediaWire) — Behind the dramatic concrete and glass façade of the Forest Hills Fine Arts Center lies a heart of…green. 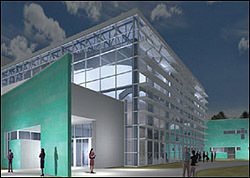 Continuing a tradition of environmental responsibility and stewardship established with the creation of the Goodwillie Environmental School in 2001, the state-of-the-art Fine Arts Center is the fourth Forest Hills Public Schools facility to meet the stringent criteria of the United States Green Building Council’s Leadership in Energy and Environmental Design (LEED) certification program. The Fine Arts Center is the first public facility of its type to receive LEED certification in the U.S. Since its introduction in 1999, the highly respected LEED system has become the international standard for assessing buildings for energy efficiency and their impact on the environment. The painstaking certification process addresses critical issues in site and building design; mechanical, electrical and plumbing systems; materials selection; and construction methods; to ensure energy-efficient, environmentally-friendly results. The principles set forth by LEED guidelines were incorporated in the planning and design of the Forest Hills Fine Arts Center, and observed with care throughout its construction, to shape a cost-effective facility in perfect harmony with its natural surroundings.